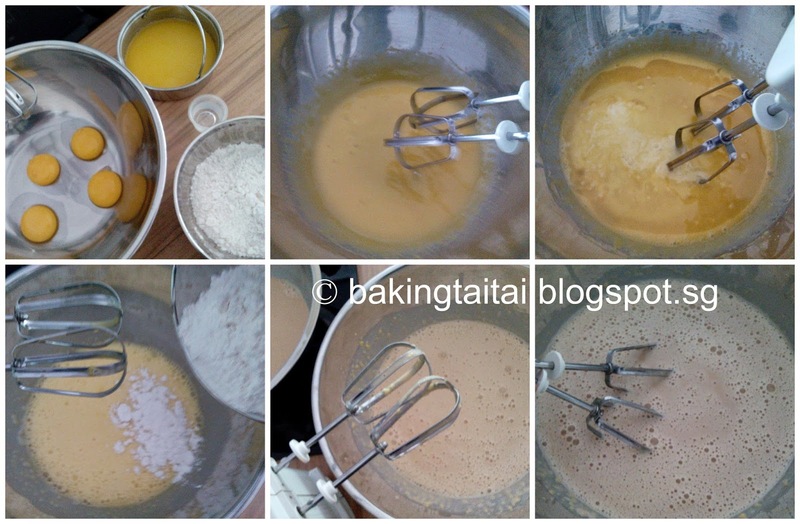 I hosted my third guest blogger Magic Custard Cake (MCC) and German Butter Cookies workshop two days ago. As usual, I will bake the original and one other flavoured magic custard cake for my participants to sample to have an appreciation of the finished product before they attempt to bake one. I was adventurous and wanted to try a new flavour which no one has tried before, hence the birth of the Gula Melaka magic custard cake. Gula Melaka is dark palm sugar made from the sap of a Palmyra palm and has its own distinct taste. It is mainly used in the local desserts and cakes of the Southeast Asian region. 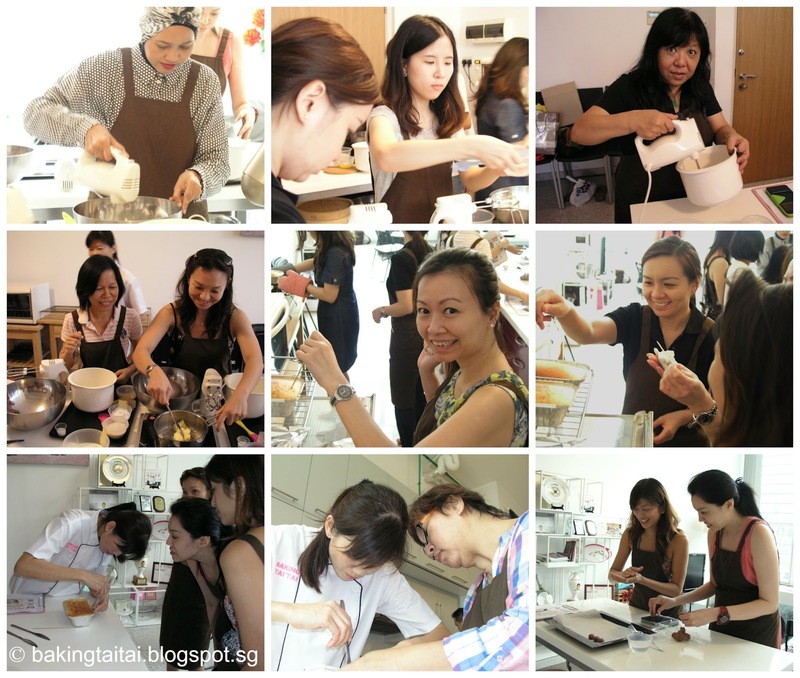 Thanks to E-Fei of LessonsGoWhere and Lena of the The Baking Loft who have been great assistants to me and my dear hubby for capturing pictures of these special moments during the workshop. Not forgetting to thank Brandt who has sponsored the recipe books - 'Simple Pleasures from the Kitchen' which I had given each participant a copy to bring home. 2. Melt the butter and set aside to cool slightly. Warm the coconut milk before adding in the gula melaka to cook over low heat until the gula melaka has melted completely. Add in the fresh milk, heat it till lukewarm, set aside. 5. In another bowl. beat the egg yolks until light and fluffy. Add in the melted butter and one tablespoon of water and beat for about 2 minutes. 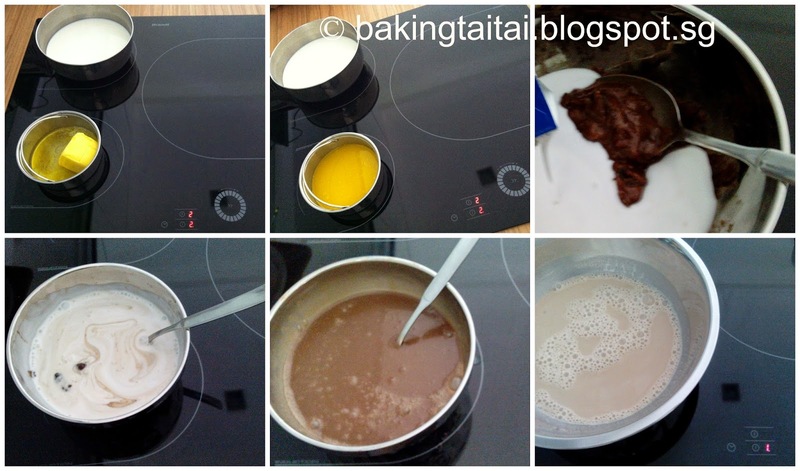 Pour in 1/3 amount of warm milk, mix in the sifted flour until evenly incorporated. Then mix in the other 2/3 of warm milk. 8. The cake will be wobbly. Hold the sides of the baking paper to remove the cake from the pan. Transfer to a wiring rack to cool the cake completely before cutting or decorating it with icing sugar. I used to like this cake after chilled but prefer to eat it warm these days. If you can't finish the cake within the day, it has to be chilled in the fridge to be consumed up within the next few days. For original flavour, please click on photo to see video tutorial recipe. 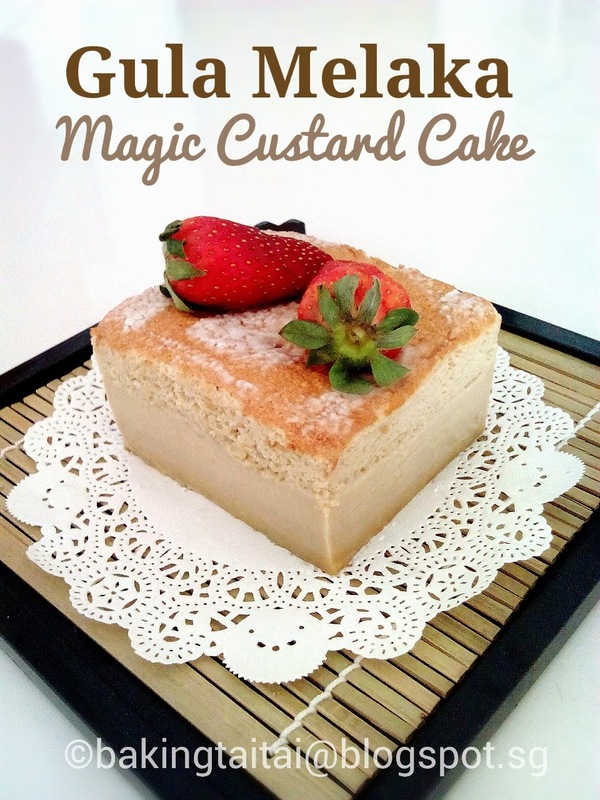 It also has a more detailed write up about the magic custard cake and how the magic works in this recipe as well as frequently asked questions. For matcha flavour, please click on photo to see tutorial video recipe. Another scrumptious creation. Yummm.... Btw, you can only get those mushroom floss at any vegetarian shop that is available in Singapore. Enjoy & have a lovely week ahead. Wow. very impressed with this. The gula Melaka sure give the cake a nice fragrance! Hi Cheryl, oh my ! ... you've added some 南洋风味to MCC ?! 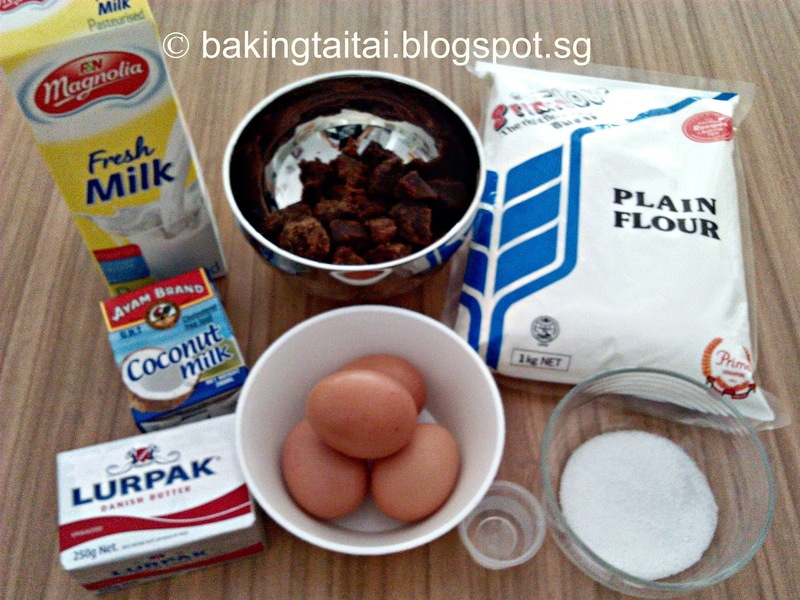 Gula melaka is very fragrant and surely give this cake a magic hit. Thanks for sharing this new flavour magic cake. A very delicious flavor that's for sure, I know cause I baked a chiffon cake with that flavor and it was awesome! I hope to bake this cake soon! Thanks for sharing! wow...this is another aromatic Magic Custard Card. Thanks Kristy, will check out the healthy mushroom floss if I come across any vegetarian shop. Have a great week too! 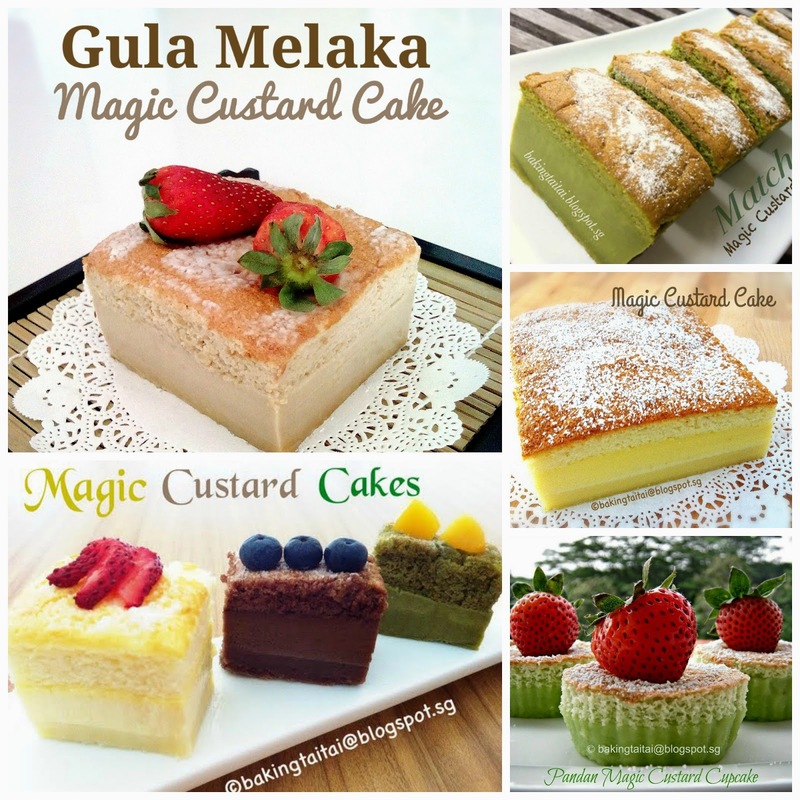 Gula Melaka must be bursting with lovely aroma. Hi there, may i know why is there so much liquid in this version (415g milk + 200ml coconut milk) compared with the original flavour (480g milk), please? Many thanks! Hi Ty, I like the custard portion best and added more liquid to get a taller custard layer. 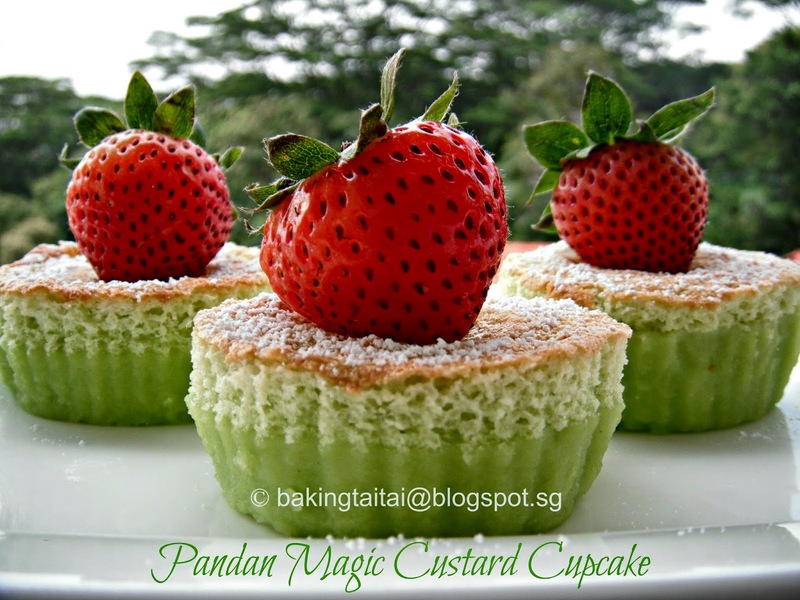 ;) If you find it too watery, you can follow milk+coconut milk proportion in my pandan magic custard cake recipe. :) oh i see, thanks so much! 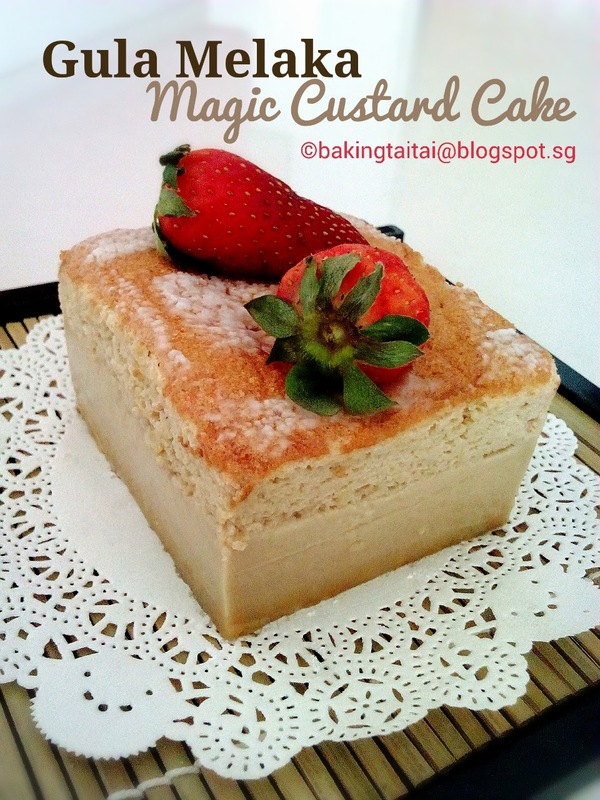 Hi I made a original Magic custard last night, after cutting the custard detached from the cake , is it normal ? Hi Joyce, it is normal for it to be detached from the cake especially if you have overbaked it and the centre soft custard layer is not able to hold the top and bottom layer together. Hello Cheryl, I made it yst and smells good and yummy. Thanks for the recipe. Only one problem here: I used fan forced oven and reduced to 150C i/o 160C and baked longer +15mins (coz the top was not brown enough). But it was cracking a little bit and still wet after cold. Is it normal? Thank you for help. Hi Angie, this cake should not be baked using fan forced. If the interior is still wet then it is not cooked through, I suggest that you bake it at 160 degree celcius using top and bottom heat, if the top starts to brown, you can tent it with an aluminium foil to prevent crack and over browning. You should test with a skewer, insert into the cake and it should comes out with slight crumbs and not watery batter to check if the cake is done before removing it from the oven.